The glories of East Asia are waiting for you to enjoy them. Click here to play! Sushi, puffer fish, sashimi, and of course wasabi! Enjoy the culinary delights of Japan as you win some massive cash jackpots. 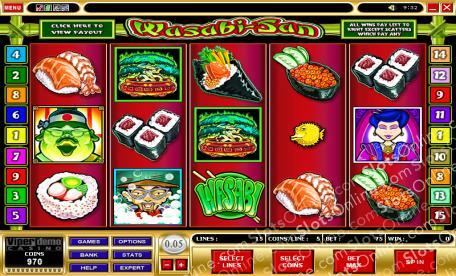 Wasabi-San is a brilliant 5-reel slot played across 15 reels with the more lines opened multiplying your payout odds on winning combinations. The Sushi Chef is Wild and can be substituted for any other symbol except Scatters and Bonuses, and can pay out up to 7500 times your wager. Wasabi is Scattered and will earn you 10 free spins when 3 or more appear on the reels. If you want to enter the Fish Market Bonus Game you will have to spin up 3, 4, or 5 Bonus Puffers to activate it. There are plenty of symbols that can earn you massive cash payouts, so head down to Wasabi-San for your chance at huge winnings. Wasabi is Scattered and 3 or more will earn you a payout as well as 10 Free Spins. The Sushi Chef is Wild and can be substituted for any other symbol except Scatters and Bonuses. If you earn 5 of them you will also be paid out 7500 times your initial wager. The lucrative Fish Market Bonus is triggered when you spin up 3 or more Bonus symbols.